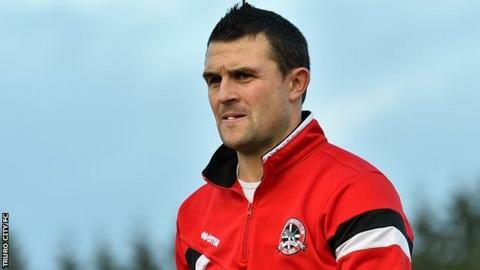 Truro City boss Steve Tully has said he is not nervous ahead of their Southern Premier League play-off semi-final at home to Hungerford Town. It is a one-off tie, with the winners coming up against either Poole Town or St Neots in the final. The game comes just three days after the Cornish side lost 3-1 at Histon in the last game of their regular season. "The nerves aren't really there for me at the moment," Tully told BBC Radio Cornwall. "I'm sure the players have woken up a little bit nervous but I thought if you had nerves before a big game that's always good." Player-manager Tully picked himself for the Histon game, which was essentially a dead rubber, and left 12 first-team players at home. Truro finished third in the division and beat Hungerford 2-1 at Treyew Road back in August. "Because we played them home and away before Christmas you have to do your homework again to find out whether they've changed," added Tully. "We've got enough experience in the squad to handle it - there's quite a few players that have been in play-off games before." The White Tigers will be promoted back to the Conference South if they win the play-offs.